KO3 Crush Nose Impact Baton for 37mm Rifled. 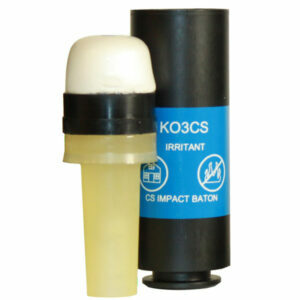 The KO3 is a direct fire crush nose chemical impact baton round that is designed to be used where a combination of kenetic and chemical agents is preferred for the incapacitation of hostile and or non compliant individuals. The KO3 imparts blunt trauma and additionaly releases micro pulverized CS or OC. Available in standard and less energy.